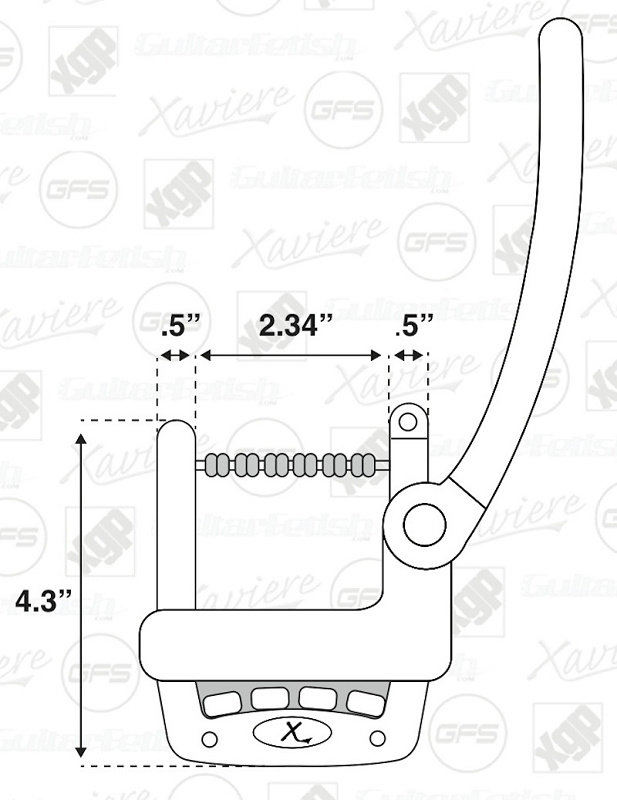 This is for BOTH pieces- the Xtrem LT AND the Xtrem Tele Roller bridge. Years in the making... the new Xtrem from Guitarfetish gives you all the great vintage sounds that vintage tremolos made famous, but with modern levels of tone, sustain and tuning stability. As great as vintage trems are, we always felt there was a better vibrato out there...just waiting for someone to make it! The Xtrems do not use the old fashioned "Axle" that uncoils the strings- No more feeding the ball end onto those fiddly pins- Restringing is quick and painless, and our unique 'hinge' design means the strings are firmly retained by a large tone block of solid aluminum, pivoting and ball bearings, and controlled by a cast aluminum "sculpted" arm- not a flat piece of sheetmetal. It's a really great unit- made to the highest standards and plated in heavy duty triple chromium plating. We ship it to you with the Xtrem assembled, a firm chrome plated spring, and four matching chrome screws. 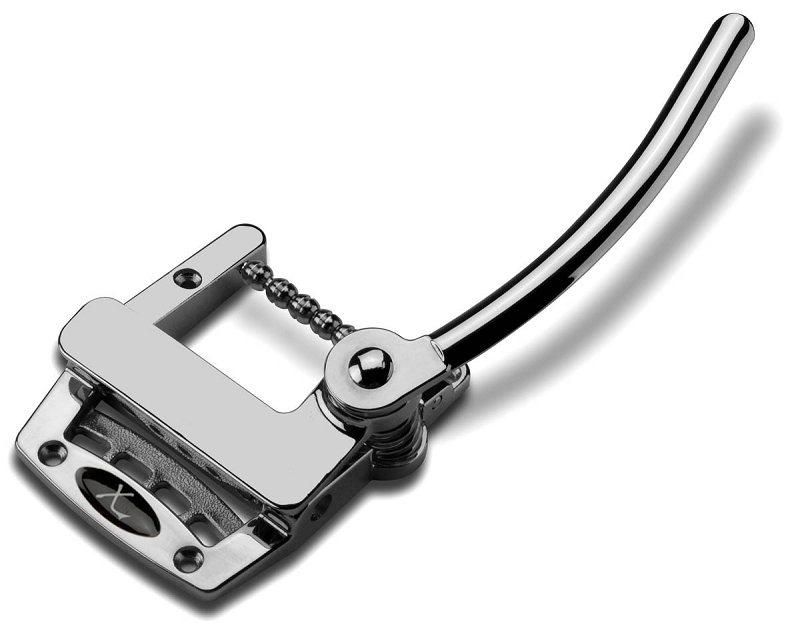 The Xtrem TM (Top Mount) is a surface mount tremolo- This means is screws securely to any FLAT top guitar. Works great on SGs, Teles, hardtail strats etc. The TM utilizes 6 low-friction rollers on the down-pressure bar- GENIUS! Strings are held down like on the vintage unit, but six rollers give you ZERO friction. So guess what- tuning stability is UNREAL. 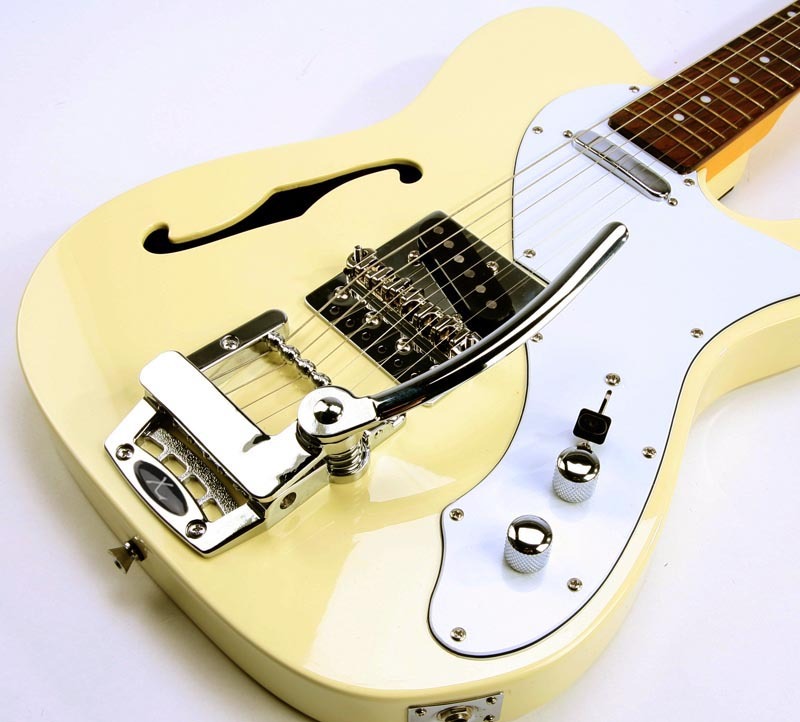 On many guitars you can use a tuneomatic or similar bridge in front of the TM. The TM is 4 1/8" long and 3 3/8" wide at the string-end. 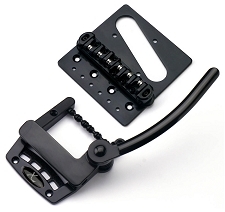 The Xtrem TM comes WITH the Tele Roller Bridge- A Genius Piece of work! 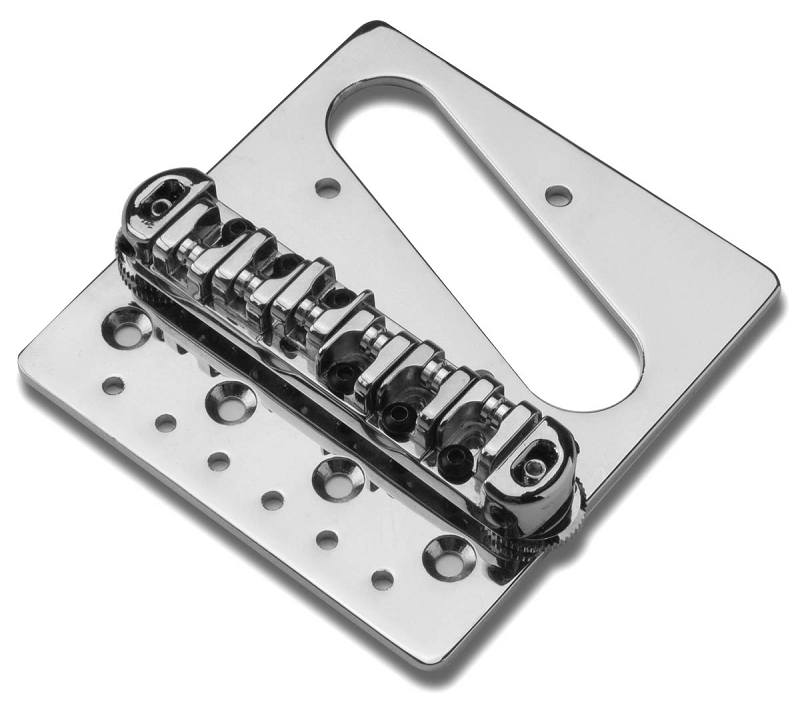 A Tele sized bridge plate made of solid steel- fits ALL correct four hole vintage Tele routs and fits fenders exact four mounting holes. 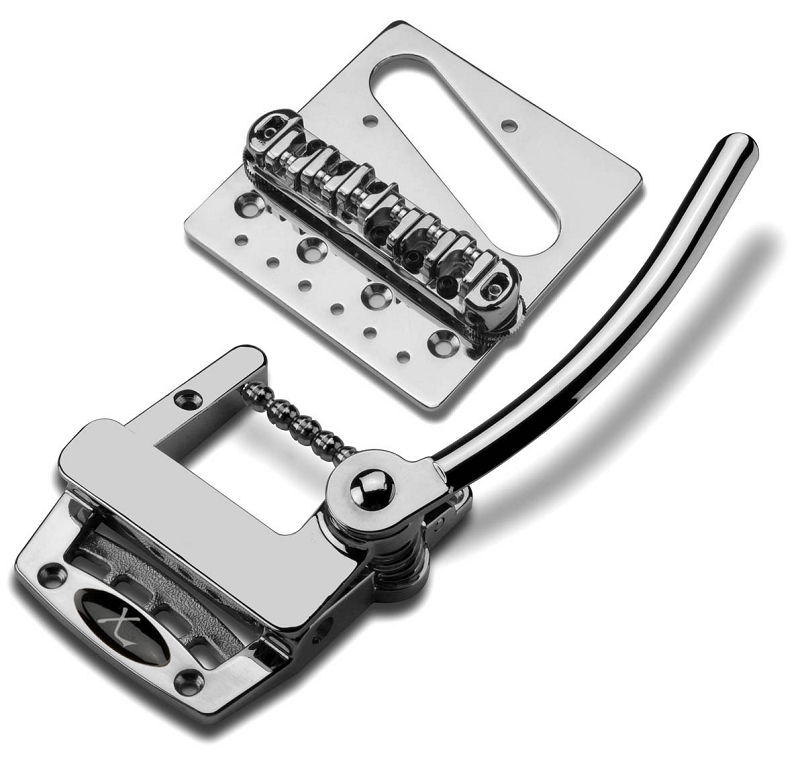 Look- we designed this to use with our Xtrem TM vibrato bridge, but we include six string holes- so you can use it by itself for INCREDIBLE tone and sustain and a fatter, rounder sound than the stamped steel fender bridge. Now listen carefully- In order to use this you MUST adjust your guitar so that you have a positive- 2.5 to 3 degree- neck angle. On some guitars this adjustment is easily done with an allen wrench- but on MOST you must SHIM the neck. We use business cards or sandpaper- some guys like old guitar picks or thin maple veneer- lots of ways to do it. 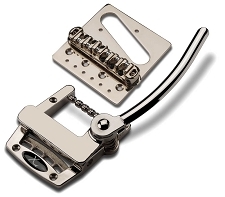 Your standard Tele bridge has an average height of 1/2"- This bridge sits about 9/16" average height. 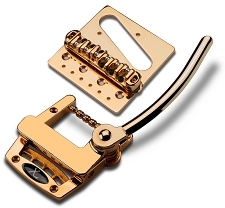 The bridge uses four grubscrews so you can easily adjust intonation- and once screwed down the bridge is firmly LOCKED to the bridgeplate.